Cpl. Francis Pegahmagabow of the Parry Island Band in Ontario was decorated three times for the marksmanship and scouting skills he displayed in Belgium and France. Known as ‘Peggy’ to other members of his battalion, he survived the war and later became chief of his band. The most highly decorated Canadian Native in the First World War was Francis Pegahmagabow. An Ojibwa from the Parry Island Band in Ontario, he was awarded the Military Medal (MM) plus two bars for bravery in Belgium and France. Soldiers who had been awarded the MM and later performed similarly heroic acts could receive up to two bars to it, denoting further awards. Pegahmagabow was one of 39 members of the CEF who received the maximum two bars to the MM. 1st Canadian Division, landed in France in February 1915. Sniping was his specialty. 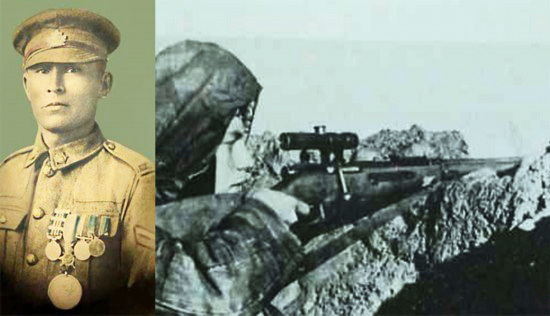 It has been written of him, “His iron nerves, patience and superb marksmanship helped make him an outstanding sniper.” In addition, Pegahmagabow developed a reputation as a superior scout. Second Battle of Ypres in 1916 and at Amiens in 1918. In April 1919, Pegahmagabow was invalided to Canada, having served for nearly the entire war. Afterward, he joined the Algonquin Regiment in the non-permanent active militia and, following in the steps of his father and grandfather, became chief of the Parry Island Band and later a councillor. A member of Canada’s Indian Hall of Fame, Pegahmagabow died on the reserve in 1952.